On Sunday 29 January Bishop Denis Nulty, Bishop of Kildare & Leighlin, will be the chief celebrant and preacher at Mass to mark the opening of Catholic Schools Week 2017. This Mass will be broadcast by RTÉ on radio and television from the Church of Saints Peter & Paul, Portlaoise, which has a capacity for 1,800 people. This year’s theme, ‘Catholic schools: Learning with Pope Francis to care for our common home’ has been informed by Laudato Si’, the 2015 encyclical by Pope Francis on care for our common home. As well as the local parish community of Portlaoise, the liturgy for this year’s opening Mass for Catholic Schools Week will be enhanced by the participation of students, staff and parents from ten local schools. Music ministry will be led by Mrs Ann Bergin, musical director, along with parish choirs. Catholic Schools Week is an annual all-Ireland celebration which invites schools to give expression in an exceptional way to the ethos of Catholic education. It acknowledges the tremendous contribution that our Catholic primary and post-primary schools make, not just to Irish society, but to the mission of the Church. Monsignor John Byrne is the parish priest of Portlaoise, Co Laois, in the Diocese of Kildare & Leighlin. The curates of the parish are Fathers Paddy Byrne, Eddie Lalor, Terence McGovern and Tom O’Connor. See portlaoiseparish.ie. Primary: Holy Family Junior and Senior Schools; Scoil Bhride; Gaelscoil; Ratheniska National School; The Heath National School; Saint Francis Special School; and The Kolbe Special School. Post-Primary: Scoil Críost Rí Presentation School and the Christian Brothers School. Catholic Schools Week will take place from 29 January to 4 February and special educational resources have been prepared to support students and teachers at primary and at post-primary level. 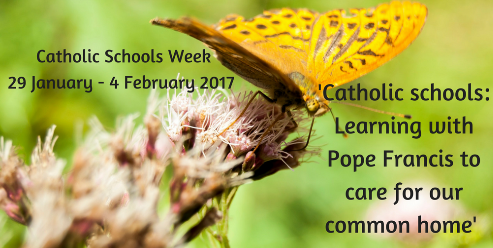 #CSW2017 resources are now available in the “Resources” section of catholicschools.ie. A dedicated Facebook page called ‘Catholic Schools Week’ shares resources and information about local events around the country and it offers useful analysis on Catholic education. Laudato Si’ was the number one bestseller for Veritas in 2015 selling over 15,000 copies. The papal encyclical sold over 1,500 copies in 2016. Veritas, owned by the Irish Catholic Bishops’ Conference, is Ireland’s leading religious publisher and retailer. See veritas.ie.